Big Block Chevy SWP Crankshaft Alternator Power Steering Water Pump Pulley Kit. Upper Water Pump (Double Groove) Alternator (Single Groove), Power Steering Pump (Single Groove) & Crankshaft (Triple Groove) Pulley Kit. These Pulleys are designed for your. Big Block Chevy 396 - 454 with a Short Water Pump. Pulley has a 2.8 Diameter. Constructed of thick gauge aluminum and with a high quality Satin Aluminum finish, this kit would be great addition to your project. 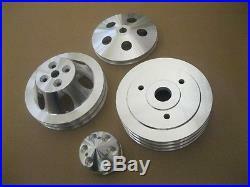 This kit also includes a Brand New Aluminum Machined power steering pump pulley. This is a single groove pulley. This fits all GM key-way power steering units through 1984 with a 5/8 Shaft. Please wait for us to send you a combined invoice before paying. We have discount prices on thousands of parts for your Street Rod, Hot Rod, and Custom Car or Truck. Parts are added to our store daily, so check back often for the latest deals! Plus, we have access to thousands of parts that are not listed. We do get hundreds of emails daily, so at times it may take us up to 72 hours to respond to your emails. The item "Big Block Chevy SWP Crankshaft Alternator Power Steering Water Pump Pulley Kit" is in sale since Friday, February 07, 2014. This item is in the category "eBay Motors\Parts & Accessories\Car & Truck Parts\Engines & Components\Belts, Pulleys & Brackets". The seller is "gearheadworld" and is located in Hudson, Iowa. This item can be shipped to United States, Canada, United Kingdom, Denmark, Romania, Slovakia, Bulgaria, Czech republic, Finland, Hungary, Latvia, Lithuania, Malta, Estonia, Australia, Greece, Portugal, Cyprus, Slovenia, Japan, Sweden, South Korea, Indonesia, Taiwan, South africa, Thailand, Belgium, France, Hong Kong, Ireland, Netherlands, Poland, Spain, Italy, Germany, Austria, Russian federation, Israel, Mexico, New Zealand, Philippines, Singapore, Switzerland, Norway, Saudi arabia, Ukraine, United arab emirates, Qatar, Kuwait, Bahrain, Croatia, Malaysia, Brazil, Chile, Colombia, Costa rica, Dominican republic, Panama, Trinidad and tobago, Guatemala, El salvador, Honduras, Jamaica.